Walking with Jesus: Day 60: Acts 17:16-21 & Proverbs 21:9-16 - How Should We Respond to the Idolatry of our Culture? Day 60: Acts 17:16-21 & Proverbs 21:9-16 - How Should We Respond to the Idolatry of our Culture? How Should We Respond to the Idolatry of our Culture? We live in a cultural context very similar to ancient Athens. Like Athens, our culture is advanced, sophisticated, educated, wealthy, internationally connected and awash in idols. Both ancient Athens and contemporary America have more idols than can be counted. Over the past two thousand years, things have changed very little: People will worship almost anything that promises to give them what they want. 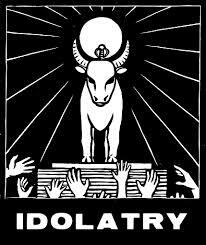 All idolatry is mercenary. We choose those idols which promise to give us what we most want. We give the idol some precious part of our lives, and we hope the idol will give us what we want. In this way, we can make an idol of anything: our job, our family, money, power, attention, pleasure, entertainment, technology, food, relationships, etc. Our cities may not be full of statues, but they are full of almost as many idols as people. So, how did Paul respond to the rampant idolatry of Athens? Did he just sigh and roll his eyes go find some entertainment to distract him? No. He allowed himself to be properly provoked by the rampant idolatry of his culture, and he took action. He went to the synagogue to reason with the devout Jews and the God-fearing Greeks. He also went into the marketplace to reason with those who happened to be there. He did this every day, seeking to find, engage and persuade people of the truth of the Gospel. How do we respond to our culture's idolatry? Do we ignore it? Do we just sigh and resign ourselves to the reality that nothing can be done about it? Or are we provoked, seeking to engage people with the claims of Christ in the Gospel? Paul's efforts at engaging people with the truth of the Gospel earned him an invitation to the Aereopagus. This prestigious forum of leading Athenian thinkers provided Paul with a unique platform for presenting the Gospel, which we'll look at in our next devotional. 1. We need to let our hearts be provoked by our culture's idolatry. 2. We need to weep over the waywardness of our culture and pray for the salvation of our neighbors. 3. We need to seek opportunities to engage people in conversations that can lead to opportunities to present the Gospel. In addition to these three things, we also need to make sure we are not joining the world in its idolatry. People who worship idols are trapped in a lie, and Jesus said the truth found in Him will set them free. We have that truth, and we need to pray for fruitful opportunities to bring the liberating truth of the Gospel of Jesus Christ to those in need. Heavenly Father, our neighbors and family members who are trapped in idolatry need Jesus. They are enslaved and they need the truth of the Gospel to set them free. Please give us opportunities to share Your truth with those in need. Prepare the hearts of those who need Christ and prepare us to speak Your word faithfully. In Jesus' name, Amen. and that the wold may have a witness of strong marriages centered on You. that we may be a blessing to our neighbors. and let us live our lives before Your eyes with integrity. and give us hearts to desire justice and righteousness. so keep us in the way of good sense, the way of life.